A double-hitter: Each portion has almost two servings of vegetables. A double-hitter: Each portion has almost two servings of vegetables. Couscous is a quick-cooking small pasta that is a welcome addition to the Thanksgiving Day table. Combined with shallots, butternut squash, spices, and spinach, this easy side dish can replace your traditional stuffing. Most people are familiar with the fine texture of regular couscous, but Israeli or pearl couscous is rarer. It is larger, about the size of a pencil eraser, with a smooth texture. Use a whole-wheat variety in place of your favorite grain or pasta. Swaps: Try a large red onion instead of the shallots; any hard-skinned squash in place of butternut; sage in lieu of rosemary. Remember: Never stuff large birds, for safety and nutrition's sake. Prepare a sheet pan with nonstick cooking spray or use a silicone baking liner. Place the shallots and the squash on the pan, and roast for 30 minutes, or until the shallots start to color and squash is just tender. 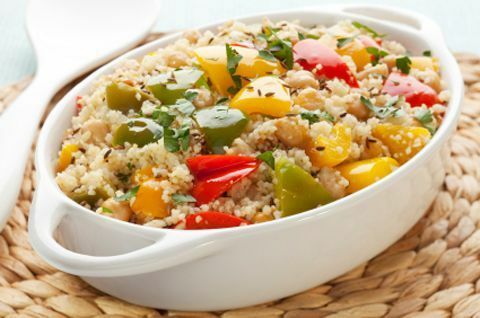 Once the couscous is cooked, turn off the heat, then add the roasted vegetables, spices, vinegar, and spinach. The spinach will steam from the heat of the couscous. Take the pan off the burner and stir in the cheese. Yes, quinoa could be substituted. That would make it higher in protein, so it would be a great side dish for vegetarians.